Khaadi – the hand spun cloth that was once such an integral part of India’s Freedom Struggle! In our home Khaadi is not just a piece of cloth. It is a tradition, a reminder of a whole bygone era. My grandfather was very active in the freedom struggle and he resolved to always wear Khaadi in support of the Swadeshi movement. 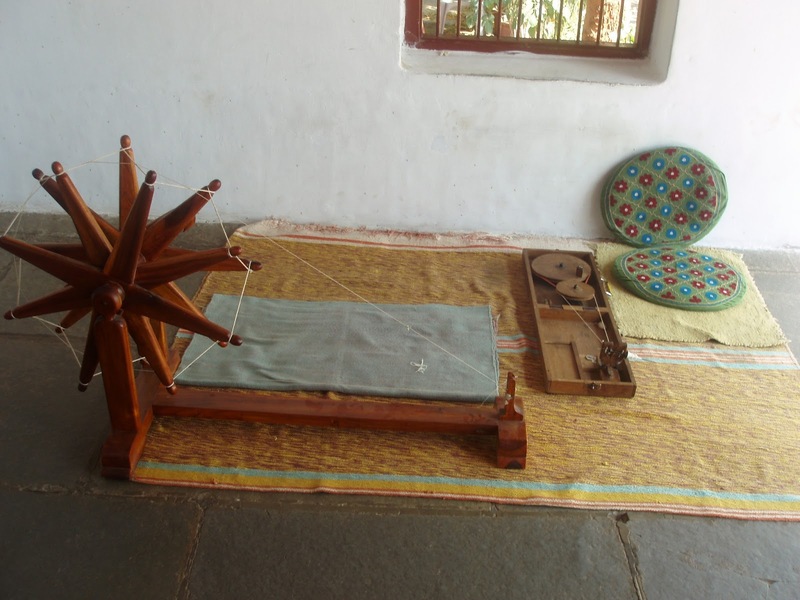 He even had a Charkha (spinning wheel) that he used, to spin cotton into thread. Mahatma Gandhi's Charkha at Sabarmati Ashram ! Till his dying day, My grandfather wore nothing but clothes bought at the Khaadi Bhandar. My images are of him always in a pure white Kurta Pyajama and a Khaadi Jacket that he used in winter. If he had to dress formally, He would wear a black Sherwani on top of his Kurta. White kurtas pajamas - Crisp and starched and a Black Sherwani unadorned by anything except his pocket watch - It was the ultimate chic look. My cousin chose to wear the same attire on his wedding, disregarding the fancy Achakans and Sherwanis that Grooms favor these days. It was his way of honoring our grandfather. My aunts and Father wore Khadi for a while and then the lure of silk and chiffon was too much for my aunts ! The task of carrying on the Khaadi tradition fell on me! As long as I remember I have worn Khaadi. In the beginning I might have been influenced by my Grandfather. But then I genuinely found it to be very comfortable. Khaadi may seem like a rough cloth to many but for me it has a certain homey and snug feeling. Its a misconception that Khaadi jackets and kurtas come only in either white or a dull green. They come in all designs and colors and you have a lot to choose from! The great thing about Khaadi is that it’s cool in summer and really warm in winter. I have lived my teens and university years in jeans and Khaadi Kurtas. I had, and still have kurtas of every color. Once I entered JNU my obsession with khaadi increased and when I added a Cotton Jhola to go with my attire I became an integral part of the JNU Jhola culture! I use a lot of Khaadi Jackets in winter and believe me they are my saviors in the harsh Delhi winters. I think they look really ethnic and smart when worn with jeans and a full sleeved shirt or top. You can wear them with your Salwar Kameez as well ! Over the years my loyalty has shifted from Khadi Bhandars to Fab India. It’s been my favorite haunt since my University days! Khaadi is now considered the attire of intellectuals - Specially in Delhi. Someone wearing Khaadi is automatically labeled as either a journalist or a writer or someone in the field of arts like dramatics ! Khaadi may not be very popular among the general public these days but I do believe that it is a integral part of our legacy and something that we should not forget! i too have a love towards the kurtas in fab india :) but are they khadi products? if they are, i never knew it. All of them are pure cotton. I don't know which Fab India you have gone to but the ones in Delhi have a very good Khaadi collection - especially in winter ! I also love khadi. It used to be compulsory to wear khadi at Banasthali where I studied. Yes unfortunately it is ! Absolutely love khadi - it looks regal to me! Regal is the correct word ! I have a request for you - can you please share a picture of your Grand dad with us? Have to add, your post gave me goosebumps - sepcially when I read about the choice of cousin's wedding dress. I don't have a scanned pic of him ..But I will scan it try to share ! Self sewn Khadi kurtis wow ! Legacies are very important. I knew nothing of this, so thank you for sharing! My grandmother was a great follower of Gandhiji and a freedom fighter. She always wore khaadi. She also had a charkha and spun her own thread. Your post brought back these memories. Thank you Suzy. When we look at his Charkha, we realize what legacy we have ! How very amazing Ruchira! I too have a deep love for Khadi. I love the cloth that is cool in summer and warm in winters. Only, I've never worn a khadi saree. I haven't seen any in my local Khadi Bhandaar. So impressed that you carry on your grandfather's legacy! As you said, it is now easy to do so what with Fab India making very chic clothes! And you're right about khadi being a perfect cloth for Indian weather! Didn't know you were a JNU alumni! You're right about the jhola culture there...similar to Presidency college in Calcutta! I have been feeling so nostalgic about JNU ! I must admit that I was not a big Khaadi fan. Not until now. Also, I was one of those who thought that Khaadi comes in either dull white or green and nothing else. I usually go to Khaadi store in CP to pick up soaps and lotions etc. You have described it so well, I think I am gonna grab some kurtas for harsh Delhi summers soon! they come in many colors like u told and in industrial exhibitions or cloth fairs its just amazing to pick from a huge collection ! Loved the grandpa memories. My nanaji loves Khadijah too. I love Khaadi too and also FabIndia :) My Khadi jacket has earned me the label of a writer and I love it. Beautiful post, Ruchira. Since then I have been hunting for a smimlar kurta but haven't found one yet. Innumerable visits to FabIndia/ Khadi Bhandar later, I am still searching to find one similar to what my buaa got from a store at Lucknow. I really like such nostalgia filled posts that you write! Thank You Rickie ! I do like going down the memory lane ! Nice post. I too a khadi afficinado and love the fabric..
Wonder where to buy them from in delhi/gurgaon at cheaper price. I had many of them during my teenage and absolute adore the aura they create. I used Fab India kurtis while in college, and I found them extremely comfortable for Chennai Weather. I din't like the color choices they had then - very dull, sober colors, but never complained then becoz of the comfy level I was in. Wow. I love this post. I am big fan of Khadi myself.The fabric truly feels so snug in winter and cool in summer. I get Khadi material from Khadi stores and commercialize it by getting them stitched as per Rohit Bal's linen designs. khadi is indeed a treasured legacy- sigh , we don't give its due ! I agree that it need not be boring as it does come in a lot of colurs. I once was a khadi person- time to replenish my wardrobe now ! Ruchira, I've always liked the look and feel of khadi, even though I've never owned any item of clothing in this material. It was very nice to read the tradition of khadi wearing in your family. I commend your cousin for honouring his grandfather at his wedding, and kudos to you for doing your bit for our national fabric. A treasured legacy being carried forward. Good to see this post. Just after college, Khadi formed a large part of my wardrobe and I got a few kurtas 2-3 years ago. Dont know about other places but Khadi stores in Rajasthan have such wonderful and newer types of Khadi prints and cloths also there is such a huge variety to choose from. I have a question: What makes khadi warm in winter and cool in summer? Please reply. Awesome information about Khadi. People are now moving back to the old ways, Khadi clothing.